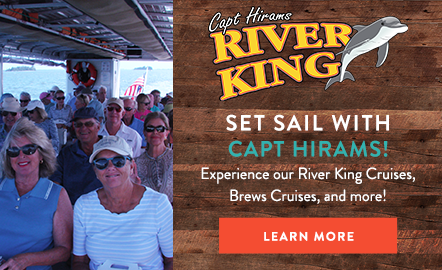 A local fixture, Blackfins at Capt Hiram’s offers Sebastian’s best riverfront dining. Grab a table on our riverfront deck for fresh seafood, including “catch of the day” specials and locally sourced plates. Serving lunch and dinner, this is Sebastian’s favorite spot for delicious island-style favorites, including conch fritters, crab cakes, fish tacos and local saltwater peel n’ eat shrimp. Don’t miss the Dirty Oysters, a Capt Hiram’s signature featuring fresh-shucked oysters served with caviar, sour cream, onions and hot sauce. Every Sunday, enjoy our Endless Brunch Buffet for $14.99 per person. Bottomless Mimosas and Build-Your-Own Bloody Mary Bar add on options available. 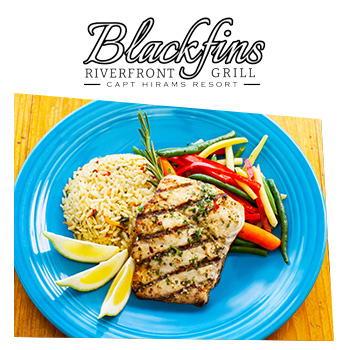 A perfect spot for private parties, birthday celebrations, weddings and corporate events, in fact, any occasion that would be enhanced by panoramic Indian River views and great food, Blackfins’ Tiffany Room accommodates up to 150 guests. This exceptional space features a dance floor, full service bar and private restrooms.